The library doors will remain locked until the library opens at 10 a.m. 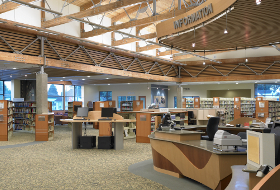 If you have a room reservation prior to 10 a.m. please call the library at 360-755-0760 and we will let you in. 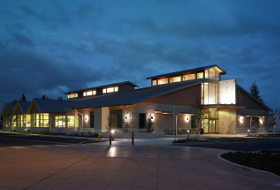 Reservations for the Burlington Rotary Community Meeting Room (BRCMR), the Burlington Hill Side, the Skagit River Side, and the Gentry Family Meeting Room may be made up to six months in advance of the event and for no more than two occurrences per month. The study rooms are primarily for drop-in use. You may reserve a study room once per week, and reservations may be made one week in advance by calling the library or in-person. Additional study room use will be on a drop-in, first come-first served basis. NOTE: Please call if you are running late for a room reservation. We will hold the room for 30 minutes before allowing another patron to use the room. You must be 18 years of age or older to reserve the BRCMR, the Burlington Hill Side, or the Skagit River Side, and someone 18 years old or older must remain in the room at all times while your group is using the room. No admission fee may be charged for events in the library meeting rooms - this includes free will offerings. Non-profit groups and government agencies may collect fees for educational workshops, and/or fees to cover the cost of study materials and supplies used in classes, workshops, and conferences with the permission of the library director. No materials, goods, or services may be sold for private profit or gain. Non-profit groups sponsoring author readings may make books available for purchase at a cost no greater than the cover price. The Library meeting rooms are not to be used by commercial businesses to make a profit, conduct business, or solicit customers in any way. The Library meeting rooms are not available for events such as birthdays, anniversaries, receptions, banquets, or parties. 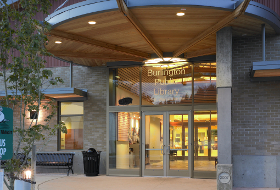 The use of the Burlington Public Library facilities or meeting rooms by any group or organization in no way constitutes endorsement of the policies or beliefs of that organization by the library or the City of Burlington. Can hold up to 150 people seated theater style, or up to 75 people seated at tables. may check out library laptop if available. Can hold up to 60 people seated theater style, or up to 30 people seated at tables. TV with built-in DVD player, may check out library laptop if available. *If your meeting continues after the library is closed, you have until no later than 10:00 p.m. to tidy the room, turn off all equipment and lights, and exit the building. *If your meeting begins after the library is closed, please be sure to have one member of your group here before closing (8 p.m. Monday through Thursday and 5 p.m. Friday and Saturday). 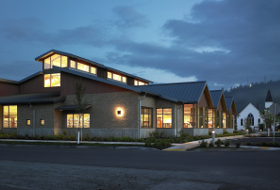 When exiting the building after regular library hours, please make sure the building is empty (including restrooms), and doors are closed firmly behind you as you leave. You are responsible for the set up and take down of tables and chairs, disposing of trash, and leaving the rooms clear and clean. We ask that groups of more than 20 park on the east side of the building, and in the lot to the northeast of the current library (the old library parking lot). When you reserve just one side of the BRCMR (the Burlington Hill or Skagit River side) there may be a group meeting on the other side, and the room divider is not sound-proof. For your comfort: Please keep meeting room doors closed. Leaving the doors open, even just to welcome people as you begin, results in a very chilly room. You may wish to practice using equipment prior to your scheduled event. If so, please call so we can tell you when the room is not in use. During your event, library staff will do their best to assist you, but we cannot guarantee that someone will be available. I have read and agree with these guidelines. I would like to reserve a meeting room.